Hundreds of students will enter Robert Eagle Staff Middle School in North Seattle for their first day of school Wednesday morning. The building will also house Licton Springs K-8 and sits next to the new Cascadia Elementary. But for all the effect he had at Seattle’s American Indian Heritage School in the late 1980s and 1990s, he ultimately wanted to return to the South Dakota reservation where he grew up, to see what kind of education impact he could have there. He never got that chance. Eaglestaff died of a heart attack in 1996 while dancing at a powwow in Oregon. He was 43. More than two decades later, the Lakota leader is remembered, both in South Dakota and Seattle, where the school district is opening a school bearing his name. Robert Eagle Staff Middle School in North Seattle will welcome its first students on Wednesday morning. The building — named “Eagle Staff” at the request of Eaglestaff’s family in South Dakota, who spell their last name with two words — also houses Licton Springs K-8 and sits next to Cascadia Elementary, another new school on the site. The three schools are among five new or remodeled buildings that Seattle Public Schools is opening this fall. The other two are Olympic Hills Elementary and Meany Middle School. Together, the five schools will ease overcrowding in the school district, which has grown by 8,000 students in 10 years. With the new schools, the addition of some portable classrooms and converting spaces like computer labs into classrooms, Superintendent Larry Nyland said the district added about 2,800 new seats this school year. “It is a real honor that a young man from a small community in South Dakota can be recognized in such a large school district, in a large city like Seattle,” Eagle Staff said from South Dakota over the weekend, as he prepared to drive their mother to Seattle for Tuesday’s ribbon-cutting ceremony. Eaglestaff was principal of the now-closed Indian Heritage School, which was housed on the same site, for seven years. In the four years before Eaglestaff died, every senior graduated, enrollment doubled and so many students wanted to attend that the school couldn’t fit them all. About a fourth of the students were non-Native, but teachers incorporated Native traditions into the curriculum and taught Native history that wasn’t being talked about in other schools. During Eaglestaff’s tenure, the school was for grades six to 12. A month before he died, it was scheduled to become a K-12 school. Eaglestaff dedicated the school to “really exploring how American Indians contributed to the United States, and to helping eliminate the idea that American Indians don’t exist anymore, that we’re extinct and can be treated as mascots,” he told The Seattle Times in 1992. The campus includes four huge murals by Haida/Apache artist Andrew Morrison, who painted portraits of Chief Seattle, Chief Joseph, Geronimo and Sitting Bull on the walls of the old Wilson-Pacific building, which was used by the former Indian Heritage program. Morrison has said he painted the murals to help Native students feel pride in themselves. The district originally planned to tear down the murals with the old buildings, but Morrison and others protested, and the district eventually agreed to preserve them as they built the new structures, which have lots of natural daylight, collaborative spaces and new equipment, like a 3-D printer. Reminders of the school’s history remain throughout the building. Near the school’s commons area, for example, students can click on an interactive screen that pulls up stories about the life of Robert Eaglestaff, the importance of nearby Licton Springs among local tribes and the history of the murals. Native-education activists say the first day of school is the culmination of a long campaign to have the new school named after Eaglestaff, which included demonstrations, an online petition and testimony at school- board meetings. But they say the opening is just a partial victory, because they also want the district to fully reinstitute a Native-focused high school, said Sarah Sense-Wilson, president of the Urban Native Education Alliance. “We are at least rooting ourselves in establishing cultural continuity and institutional memory, and there is a strong positive feeling with that, but we still have this unsettling unfinished business,” said Sense-Wilson, who is Oglala Sioux. Before the ribbon-cutting ceremony Tuesday, Nyland said the district continues to look for ways to boost the academic performance of Native students, who, as a group, graduate at a rate far lower than their classmates. Licton Springs K-8, which shares the building with Robert Eagle Staff Middle, has a Native-centered focus, and about 30 percent of its student population is Native. The district’s Huchoosedah Indian Education Office also works with many of the district’s roughly 500 self-identified Native students through supports like after-school programs and tutoring. Federal funding supports many of those programs. But there is nothing in the district matching the old Indian Heritage School. After Eaglestaff’s death, Indian Heritage’s enrollment declined and the school languished. In 2013, the program was combined with another high school and moved to Northgate Mall. “I would like to see the re-institution of that type of school or environment, not only to address the Native-American graduation rates, but to take on the whole concept they had before,” Tom Eagle Staff said. For now, he said, the Eagle Staff family is appreciating the work done by Native advocates for the school. 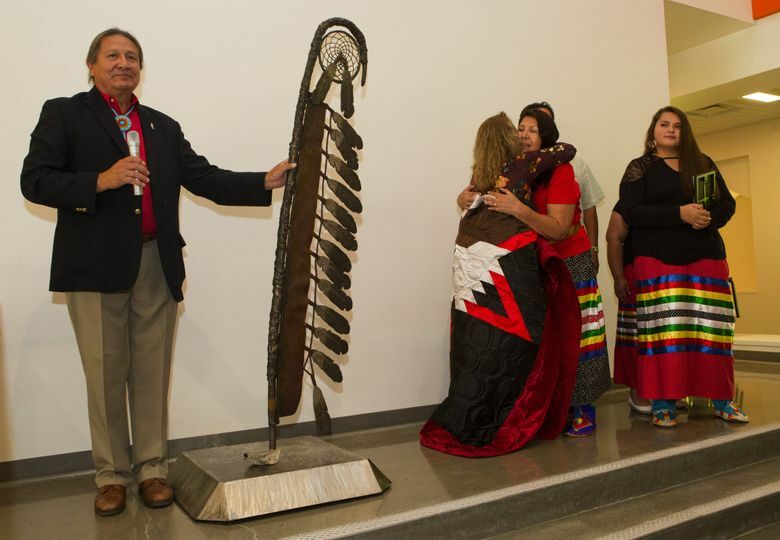 At the ribbon-cutting ceremony, the family presented to the school a towering bronze eagle staff, which an artist unintentionally made 6-foot-6, the same height as Eaglestaff was.